Emission Designator: 3G AWS / 4G LTE (G7D). -- The amplifier will pass 3G AWS 4G LTE VoLTE (Voice over LTE) signals back and forth where available when. -- The amplifier will pass Data over 3G AWS 4G LTE signals back and forth when the tower and phone are both capable. “LTE Discovery". Emission Designator: 4G LTE(G7D). The antenna coaxial cable will then transfer that signal into the house where the amplifier will boost it to 3-5 bars. -- The amplifier will pass 4G LTE VoLTE (Voice over LTE) signals back and forth where available when. 1 1700MHz Booster. 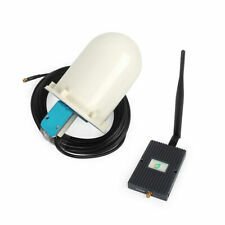 We are a leading manufacturer of cellphone signal booster for many years. Coverage in adjoining rooms will be reduced by walls and ceiling/floors. How does it work?. Can I use the signal booster when the outdoor signal has 0 bar?. Otherwise the booster can not improve your signal. LTE Band Number: Band 4. 1 Booster Units. Booster Specification 1 Outside Panel Antenna. 1 Inside Whip Antenna. Connector Type: N Female. Frequency Range Uplink: 1710~1755MHz. A3.The cell phone will produce strong radiation if the signal is weak. But after using repeater, indoor signal is improved. Cell phone radiation would be reduced. A1.AWS/LTE is most frequently used in Canada. 1x 1700MHz Repeater. Signal using a small power cover-age within building will be more uniform, reduce the cost of inputs. One is the indoor antenna which communicates with your cell phone or laptop data card, and another one is the outdoor antenna which communicates with the cell tower. 1 9dBi Gain Outdoor Directional Yagi Antenna with 10m (about 32.8 feet) Cable. 1 3dBi Indoor Whip Antenna. You should get 2-3 bars of stable signal in the location where the outdoor antenna is fixed in, or the booster can't work. Signal using a small power cover-age within building will be more uniform, reduce the cost of inputs. One is the indoor antenna which communicates with your cell phone or laptop data card, and another one is the outdoor antenna which communicates with the cell tower. The amplifier is suitable for 1700MHz (B4). [ READ BEFORE YOU BUY ] The outdoor antenna is an adhesive outdoor antenna. It is small in size and easy to install, but the gain is only 5dBi. So if you can't be sure that you can get FULL-Bars 4G signal when you are by on the balcony or roof, the amplifier can't work well for you. With this Signal Booster, It can Improve your Phone Data upload & download speed and reduce missed & dropped calls, You can enjoy a faster network experience. Supports for multiple simultaneous users, Inside signal covering 1- 2 rooms up to 1500 square feet. ANNTLENT booster provides a rapid and perfect solution to solve and optimize the weak signal of houses, offices, hotels, elevators, underground parking lots and other small weak signal area. Welcome you all to order. Any problem? Pls do not hesitate to write an email to customer services to solve. We provide the best sale service and after sale service.Thank you. Signal Repeater Booster. Tightly connect the 10m coaxial cable to the outdoor antenna and the OUTDOOR port of the repeater. Tightly connect the indoor whip antenna on the INDOOR port of the repeater. (7) AC power adapter is steady green light, but Booster / Reapter light keep flashing. Clearer voice for AWS 3G 4G -- The amplifier will pass AWS 3G 4G signals back and forth where available when. The antenna coaxial cable will then transfer that signal into the house where the amplifier will boost it to 3-5 bars. How does it work?. Can I use the signal booster when the outdoor signal has 0 bar?. What do I need to know before ordering a signal booster?. Before ordering, you need to know your network operator frequency. 3、The signal booster coverage depends on the outside signal strength received by the outdoor antenna. The coverage gets wider if signal strength is strong. 1,Booster X1. 2,User manual X1. Anycall booster provides a rapid and perfect solution to solve and optimize the weak signal of houses, offices, hotels, elevators, underground parking lots and other small weak signal area. Welcome you all to order. Any problem? Pls do not hesitate to write an email to customer services to solve. We provide the best sale service and after sale service.Thank you. AWS 1710~1755MHZ 2110~2155MHZ. Otherwise the booster can not improve your signal. Frequency Range CDMA 824~849MHZ 869~894MHZ. 1 Dual Band Booster. Booster Specification The booster receives the outside signal from the outside antenna. Uses frequencies in the 824-894 MHz range. 4G uses the frequencies 1700/2100 MHz. referred to as 1900 uses the frequencies 1850-1990 MHz. The other band is PCS which is the 800 MHz band. Frequency: UI: 824 - 849 MHz, 1710 - 1755 MHz. Before purchasing a signal amplifier, you need to confirm your phone band, otherwise the product will not work. You should get 3 bars of stable signal in the location where the outdoor antenna is fixed in,or the booster can't work well. Emission Designator: AWS 3G / LTE 4G (G7D). This signal booster is aim to Reduce dropped & missed calls and improve 4G LTE data speeds, it can improve your inside signal from 1-2 bars to 4-5 bars. LTE Discovery ( This app is especially for signal tower direction). Emission Designator:LTE(G7D). You should get 3 bars of stable signal in the location where the outdoor antenna is fixed in,or the booster can't work well. All in good shape. one power cord has been repaired. The Screen Will Guide You To Install Repeater Set Correctly. Sleep Function Makes Product Life Longer. Repeater Will Stop To Work If There Is No Cell Phone Connected. Thick Aluminium Alloy Shell Covers Mainboard, Safe Without Radiation. Get Clear Voice When You Make Call. No More Drop Call. Network Speed will be much faster. A1.AWS/LTE is most frequently used in USA and Canada. This repeater can work for most cellular operators in USA and Canada. Global application ATNJ factory DUAL BAND 850/1700MHZ 2G/3G/4G signal repeater. DUAL BAND Pico repeater is applied specifically in small area indoor DAS system. The base station signal is coupled and amplified by Pico repeater into in building system. Frequency(CDMA AWS) Bandwidth: 1700MHz. Signal using a small power cover-age within building will be more uniform, reduce the cost of inputs. One is the indoor antenna which communicates with your cell phone or laptop data card, and another one is the outdoor antenna which communicates with the cell tower. Outdoor yagi antenna. Fix up outdoor antenna(usually use the yagi antenna) on the housetop and point to signal tower. Coverage will vary with outside signal strength, interior walls and distance from the Base Unit. AWS 1700MHz Band 4. Outdoor yagi antenna. Fix up outdoor antenna(usually use the yagi antenna) on the housetop and point to signal tower. Coverage will vary with outside signal strength, interior walls and distance from the Base Unit. 3、The signal booster coverage depends on the outside signal strength received by the outdoor antenna. The coverage gets wider if signal strength is strong. This Single Band Booster is designed to work over the AWS 1700 MHz Bands 4, GSM 850mhz on Networks used by AT&T Verizon ( or any other carriers on 1700mhz network). both phones in a conversation are 1700mhz capable. 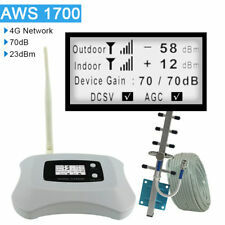 AWS 1700MHz Cell Phone Signal Repeater 3G Amplifier LTE Extender For T-Mobile Bell Mobility. Single band 1700MHz 65dB. Package Content:1*65dB 1700MHz Single Band Repeater. GSM 850 2G 1700MHz. This is double LCD displays ! You can check the which signal is good or not. 850mzh and 1700mhz. As your outdoor signal strong enough, it will appears. Outdoor antenna received the signal from signal tower. 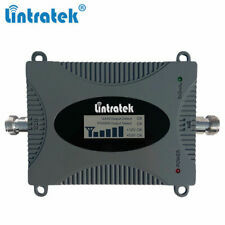 Lintratek 4G LTE Signal Solution: 1. You should get 4 - 5 bars of stable signal in the location where the outdoor antenna is fixed in. Specification : Frequency range : UL 1710-1755mhz ; DL 2110-2155mhz Max. This cell phone signal booster could work with 2G 3G Band 5 and 4G Band 4 network frequency. Connect the 32ft coaxial cable to the Outdoor LDPA Antenna 2. Connect the 32ft coaxial cable to the OUTDOOR port of the signal booster. Lintratek 4G LTE Signal Solution 4G LTE DATA: Say goodbye to slow data connection, better signal for the best life. Work for most US carriers. Check and find a place where your cell phone can receive the best signal outside your house, usually on the roof, or high places, then fix the outdoor antenna there, and the outdoor antenna should be pointing to the cell tower's direction. Easy claims process online 24/7. - Local pick up is not available. (C) If item was opened, any parts removed or repaired by any unauthorized person. The warranty shall not apply to the following circumstances - Local pick up is not available. FIVE BANDS: 1930-1995 PCS, 869-894 Cellular, 2110-2155 AWS, 746-757 LTE, and 728-746 LTE. Plus, it's portable, so you can easily take it with you wherever you go. 3、The signal booster coverage depends on the outside signal strength received by the outdoor antenna. The coverage gets wider if signal strength is strong. 1,Booster X1. 2,Indoor Ceiling antenna X1. 4G LTE DATA: Say goodbye to slow data connection, better signal for the best life. Work for most US carriers. FCC Authentication Certificate! EASY INSTALLATION: All parts included in the kit,including main device, antennas, cable, US power plug, user manual.